AMEN Corner: Be An Authorized Distributor of God's Blessings! Be An Authorized Distributor of God's Blessings! Five years ago, I wrote to you about the “Chinese Blessing Scam” and last week the L.A. County District Attorney’s Office released a warning that “religious seniors” are once again being targeted. Here’s how it works. The con artist posing as a “spiritual healer” encounters a well-dressed older victim in a public place and “sees” that a curse of illness and impending death has been placed on the person or the person’s loved ones. The only way to “break the curse” is to have something of enormous value blessed by the “healer.” The person goes to the bank to withdraw large amounts of cash and places it in a paper bag along with jewelry to be “blessed.” Bags are switched and you can guess the outcome of this spiritual swindle. One senior recently lost $70,000 in the Chinese Blessing Scam. Those who are not Christian but are “spiritual” are most vulnerable to this scam but even Christians occasionally fall victim. The scam started among the Chinese population because their religion is composed of pagan superstitions and folk beliefs involving the worship of numerous gods and goddesses who bless or curse people. Chinese spiritual healers are paid to “heal” people of major illnesses by using magical talismans to break the curse of a deity and con artists take advantage of these cultural beliefs. It’s asking for God’s favor on another person that changes us from just being blessed to being a Blessor. Invoking God’s favor on another brings a renewed awareness of God into their thoughts and the reality of His presence into their lives. Our spoken blessing over another, commends that person to God through our petition. We bless in the name of God because we acknowledge Him as the source of the blessing. When we say, “Bless you in the name of Jesus” we are invoking the fullness of His love and grace. 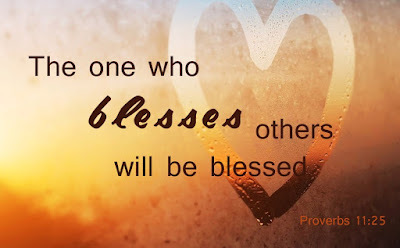 When we say, “May God bless you today,” we connect that person to their Creator and open him or her up to receive all that God has for them that day. Our blessing of others can sometimes even knock people off their feet! We were at a women’s boutique clothing store in Ventura when God gave me the opportunity to minister to someone working there. She was an extroverted woman who told me she was a new-age healer. She did aroma-therapy, read people’s auras and gave spiritual readings. Every time we saw her, we’d talk about spiritual and faith-related things and she knew I was a pastor. I was struggling with how to tell her that the Almighty God was so much more powerful than the gods and goddesses she was seeking. How do you tell someone that “my God is better than your god!” Then one time she asked for prayer. I lightly touched the top of her head with my hands and quietly said, “May God fill you with His blessing.” Her entire body shuddered as if she had received an electric shock. She took a couple of steps back, but her legs were buckling under and she grabbed the counter to keep from falling backward into a clothing rack. She put a hand to her chest and said. “Wow. I could feel that inside me!” She stood there looking dazed like she was trying to figure out what had just happened. She said, “That was so powerful. I’ve never felt anything like that before!” I knew immediately what had happened and laughed. While I was trying to figure out the best way to tell her about God, He showed her the power of the Holy Spirit and nearly swept her off her feet! She thought she knew what spiritual energy was, but the power from her spirits were puny in comparison with the power of the Holy Spirit. She said I was a “gifted healer” and I told her “No, I’m not” and that I was completely powerless. I told her it was God who had just blessed her by showing His true power and told her that knowing the One True God would now forever change her life. We never saw her again. God had brought us into her life for that one blessing. I have found that when a person is experiencing anxiety or grief over something, blessing that person with God’s grace and peace will have an immediate and noticeable effect. You will often see an instant transformation. Their facial expression will become more relaxed and they may say something like, “I feel so much better now!” They feel better because they have just felt the sensation of God’s peace in their spirit. When God’s blessings are given in His name, the healing power of the Holy Spirit can be immediate. You are all blessed indeed! But I believe that God wants more for you. He wants you to be His partner in the blessing business. He wants you to be an authorized distributor of His blessings to others. He wants you to bless your family and your friends. God wants you to bless the strangers that He sends to you. God wants you to be the one who intersects the life of the clerk in the produce department when he’s stressed and depressed. When you ask him how he is and he says “fine”, and you know he’s not. God wants you in that retail store where the worker needs a word of encouragement and He wants you to be at the hairdressers when the stylist’s son has a high fever. God wants you to speak life-transforming blessings into the lives of others. Be blessed. Be a Blessor! Amen?